Borough cruised to their biggest win of the season in the English Clubs Championship at Fengate this afternoon (April 6). 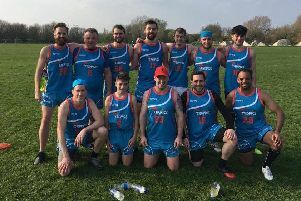 They were at home to rock-bottom Melton Mowbray and cantered to a whopping 78-0 win against a side already relegated form Midlands Division One. The visitors, to their credit, never gave up battling but were woefully outclassed by superior opposition. 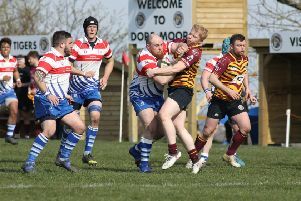 Borough rested a handful of leading players with Zak McClure, Ross Chamberlain, Rob Mould, Jamie Dingle and Owain Pearce all given a break, but still managed to run in 12 tries - eight of them converted - in a very one-sided final home fixture of the season. Borough’s tries were scored by Joe Andresen (2), Michael Bean (2), Sam Crooks, Josh Myles, Mooki Tshepo-Olebile, Ryan Adams (2), Sam Cowell, Levan Stapleton and Dewi Pearce. Matt Newman kicked five conversions and Andresen three. Borough: Joe Andresen, Ryan Adams, Michael Bean, George Offer, Ryan Morris, Phil Powell, Jack Balaam, Dan O’Connell, Dewi Pearce, Stuart Day, Scott Mills, Josh Myles, Louis Swindells, Mooki Tshepo-Olebile, Sam Crooks. Subs: Levan Stapleton, Sam Cowell, Matt Newman. Borough are now fourth in the table, just two points behind Oadby Wyggestonians with one game (away to Northampton Old Scouts) remaining. Oadby’s last fixture is at home to second-placed Paviors. Oundle have dropped to fifth following their 42-31 loss at home to Oadby. The Oundle try-scorers were Saad Sait (2) and Luke Sharpley with Will Carrington kicking four penalties and two conversions.